In 1859, a brick house on the corner of King and William Street became Beamsville Public School. The home was purchased for $5,000. And was known as “Henry’s Folly.” The high school occupied the house directly beside the elementary school. In 1917, BDSS as we know it, was built and Beamsville Public used both buildings for its elementary school. 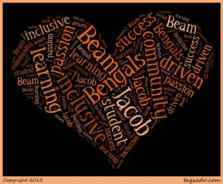 Today Jacob Beam has a school population of 298 students with a staff of 25. We have 10 home room classes from Grades 1 - 8, a Special Education class and Junior and Senior Kindergarten as well.